1 – The meeting is very time consuming and lasts much longer than planned. After all, it is not anyone who manages to remain 100% focused on a very long meeting. When participants lose focus (or interest) in what is being presented, the review meeting loses its purpose. 2 – The team leaves the review meeting demotivated. There are times when the P.O. feels the need to "shake" the team a little bit. This is normal, but sometimes these are so frequent or intense that make the team feel demotivated or discouraged. The P.O. needs to be careful here to direct the criticism to the problems and not the people. 3 – Discussions at the review meeting are not productive. 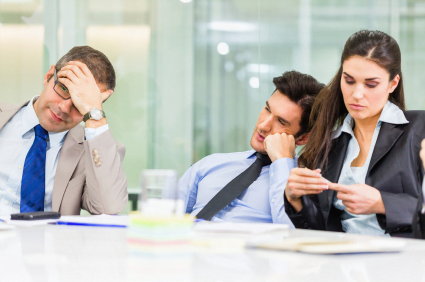 It is extremely easy to make a meeting misdirect with unproductive discussions. For some people, the temptation to just take the time to address an issue on some business rule controversy when a certain story of the same topic is being presented is too overwhelming. The Scrum Master should remind everyone that the purpose of the review meeting is the inspection of what was done and not inquiries on requirements. 4 – The team leaves the meeting without the understanding of why the stories have been reproved. The P.O. should be able to explain to the team why a story was rejected and the team should be concerned about what will be needed to correct it. Without this understanding, the necessary corrections will not be possible, and the story can be rejected again. 5 – People in the meeting pointing out whose fault is that the story have been reproved. A failed story is not the fault of a specific individual, but the team as a whole. The purpose of the review meeting is not to point out who is guilty of what. This kind of discussion should happen in the retrospective meeting, if appropriate. 6 – People are not aware of what is happening in the sprint. If any team member arrives at the sprint review meeting without knowing that a story wasn't finished, why a decision has been taken, or other significant events that occurred, this person will not be able to actively participate in what is being presented, nor will pose relevant questions and will thus not benefit from the discussions.